Join us all month for The Florida Book Review's coverage of the 2016 O, Miami poetry festival. The backyard space of MADE at the Citadel (a collective art space in Little Haiti) was set up with mismatching patio seating for the debut of Anything of Value. The poems in this interesting chapbook, as explained by the creator and one of the contributing poets, Cherry Pickman, were based on photographs of painted signs and storefronts in Miami. The idea was to have three poets writing in three different languages and to present their work untranslated in order to convey a true Miami experience. Pickman was the English poet, Fabienne Josaphat contributed poems in Haitian-Creole, and Legna Rodriguez Iglesias provided poems in Spanish. For the sake of the audience though, the non-English poems were read in their original language and then again in English. This didn’t take away from the project, as it was humorous and interesting to see who in the audience could understand the Haitian-Creole or Spanish poems based on their reactions. Josaphat read first, providing her own English translations. While I don’t understand Haitian-Creole, I tried to hang onto words that stood out and connect them to the words in her translations. Pickman followed her, providing more insight into the project and the photographs in the chapbook. She had utilized the signs directly in her poems, often as titles. Iglesias read last, and I found myself laughing at her poems in Spanish and noticed people turning to me, missing out on what was funny until it was read again in English by J.V. Portela. The reading certainly struck me as an accurate representation of the culture here in Miami, a vibrant accumulation of different languages and what they bring to the city. Iglesias made a comment during her reading that struck me as a strange but on-point summarization: she observed that Little Haiti was the part of Miami that reminded her most of her hometown of Havana, Cuba. Aprl 23, 2016, 10 p.m.
Half-way between a poetry reading and experimental play, the second night of Poetry Press Week featured the work of five poets: Denise Duhamel, Gregg Shapiro, M.J. Fievre, Yaddyra Peralta, and myself. The night began with a club-vibe: DJ Hotpants mixed music in the background, while attendees mingled over free beer in the converted warehouse that is one of MANA’s art galleries. No one was really sure what to expect. Near the entrance was a photo backdrop that looked like it belonged in Entertainment Tonight, except that, instead of designer labels, it featured poetry. The event had been advertised as the poetry version of Fashion Week, but that was not quite true. There was no cat-walking or expensive clothing. Instead, as the lights dimmed, the audience encountered experimental videos, individual readers, masked readers, groups of readers blending their voices, and one poetry-play. It was the duty of the featured poet to find “models” for their poems: i.e. creative ways for other people to present their work. Some poets, Denise Duhamel and Gregg Shapiro, chose to simply have a friend or fellow poet read their work. Others, Yaddyra Peralta and myself, used video and a mix of readers. M.J. Fievre directed a poetry-play, complete with actors, drummers and props. After each performance, the poet/director stood and waved so that the editors in the audience could recognize the poet, and perhaps talk to them afterward about publishing some of the pieces. Poetry Press Week is the brainchild of Liz Mehl and Justin Rigamonti of Portland, Oregon. Their idea was to change the way that publishers encounter submissions. Instead of the normal, distanced, and exhausting slush-pile process, Mehl and Rigamonti wanted something more creative. They founded Poetry Press Week in order to present work to editors of literary magazines in a way that is more human and true to the spirit of the work. In the audience on Saturday night were: Elizabeth Scanlon, Editor of American Poetry Review; Gabrielle Calvocoressi, Poetry Editor of Los Angeles Review of Books; Major Jackson, Poetry Editor of Harvard Review; and Saeed Jones, Executive Editor, Culture, of Buzzfeed Literary. 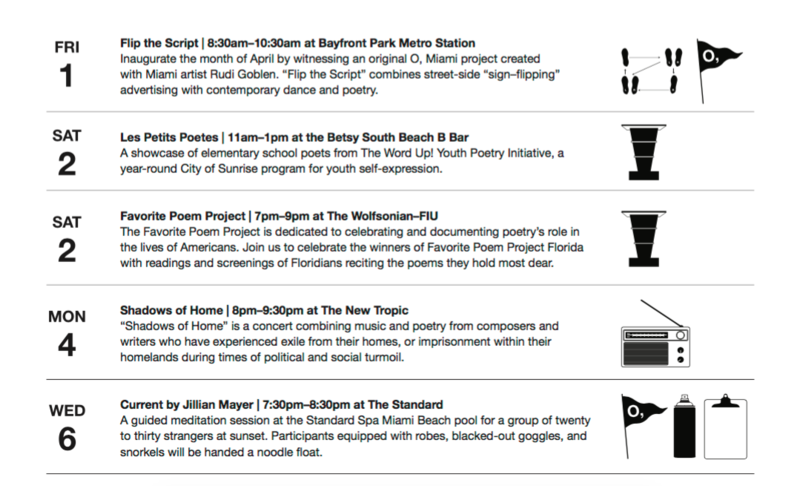 O, Miami and Poetry Press Week teamed up to produce the first ever PPW event outside of Portland. It was a labor-intensive affair, including multiple rehearsals, pre and post parties, sponsors, lighting and sound design, stage plans, and audio-visual planning. Four Poetry Press Week staff members were flown in the coordinate and execute the event. I do not know if there will be more Poetry Press Weeks during future O, Miami Poetry Festivals or if this was a one-time occasion, but it was a magical event and I am grateful to have been included in it. April 22, 2016, 8 p.m.
Once the festivities got under way, it was a night where the finest lyrical designers put their best verse forward as the poetry-loving public, literary publishers, and members of the press gathered together to celebrate the art of the poetically avant garde. 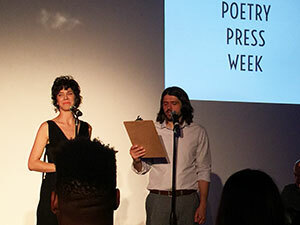 O, Miami was the host of Poetry Press Week, held in the chic venue of Mana Contemporary in Wynwood. Originally started in Portland, Oregon in 2013 by poets Liz Mehl and Justin Rigamonti, the event’s popularity has grown in that city such that it is produced biannually, much like its inspiration, the legendary showcases in the fashion industry known as Fashion Week. 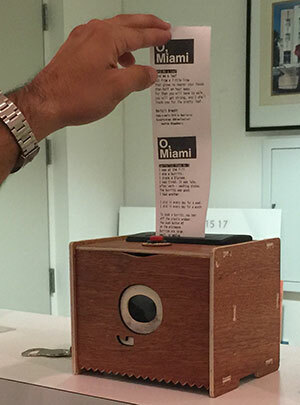 Now that it has made its way across the country to Miami with the help of O, Mehl and Rigamonti hope to spread the concept, and iterations of the event, to other culturally receptive cities around the country as well. The showcase featured the creative talents of rising and established poets as they presented their newest, unpublished works in exciting and unexpected ways. Utilizing mixed media that combines visual, auditory, and performance art—the poets were not allowed to read their own work—the artists created presentations that brought their poetry to a new level of perception, and appreciation, by the audience. If the concept reminds you of a challenge ripped from an episode of Project Runway, then you’re on the right track in terms of edgy showmanship displayed by the evening’s participants. 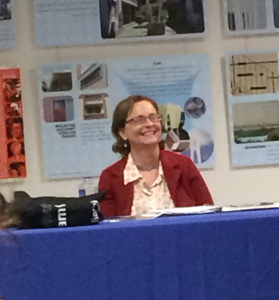 Hale’s presentation even prompted Gaby Calvocoressi, senior poetry editor for the Los Angeles Review of Books, to approach the young poet during intermission, no doubt to speak to her of possible opportunities the editor may be able to offer to her. Calvocoressi, along with Saeed Jones, executive editor of culture at Buzzfeed, were just some of the literary influencers in attendance that evening. After the performances concluded, attendees were invited to attend the after party, held down the block and across the street at Kit Ace, a hip purveyor of chic athleisurware. Guests were treated to sweet and tender carved meats and specialty cocktails made of vodka with lemon juice, spiced with ginger. They also enjoyed some more locally grown talent in the form of musician Keith Johns, who entertained the crowd with lively covers of songs like “Hey ya” by Outkast. At the prompting of the poets in the audience, he then opened up and wowed us with his own original, haunting and powerful music from his album, Grateful Fool, due out in October. I made plans to go to his single release party, set for June 3 at Wynwood Yard. It was just another way that poetry—or rather, those who create it—continued to encourage art to thrive in Miami. April 15, 2016, early a.m.
West Kendall residents got a little surprise on their lawns on Tax Day—and no, it’s not from a neighbor’s dog. 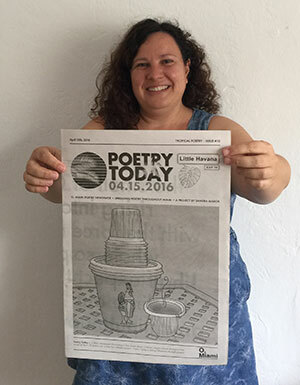 O, Miami is spreading the good news about local poetry through its Poetry Today project. Throughout the month of April on each weekday, West Kendall residents receive a mini edition of the poetry-themed newspaper, each focused on a different neighborhood in Miami. There will be 20 editions in all, distributed to about 700 homes each day, featuring a total of 110 lyrical greetings from neighborhoods as diverse as the Downtown core and Shenandoah to the Venetian Islands. 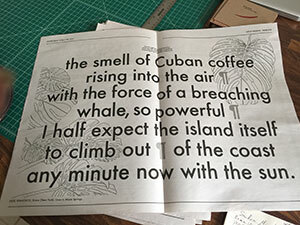 Select editions of the paper will also be distributed during other O, Miami events this month. of the coast any minute now with the sun. April 12, 2016, 4:30 p.m. It was having to lie so still all the time that got to AnneMarie. And the sound of the heart monitor when it fluttered out of sync with the measured peep…peep…peep she had learned to tune out. This was the hardest work she had ever done, this effort to move as little as possible in her hospital bed, so that she could give her baby girl a chance to grow and get stronger, be ready to face the world outside the cramped and fibroid-filled environment of her womb. When I would come to see her, which was several times a week at this late stage in her pregnancy, we discovered, among the talking, the prayers, the playing of music, and the laying of hands, that one of the things that helped little Amelie the most was when I read lyrical poetry to her, right through her mother’s tumor-ridden belly. Her favorite one was “Still I Rise,” by Maya Angelou. I remember reading it to her during AnneMarie’s eighth month, when it was harder to still her oversized womb, and harder still to keep the monitor on a steady, ignorable rhythm. When I spoke the last lines of the poem, “I am the dream and the hope of the slave/I rise/I rise,” I saw a tiny bump appear on my friend’s belly, reaching for me. Amelie was born soon after that—small from being so crowded by the fibroids, but otherwise healthy. She will be eight this year, and loves to read poetry, but still prefers it being read to her. I’m no doctor either, but hs I look for new poets to introduce to Amelie, I am fully convinced of, and endorse, the protecting, reparative power of poetry. April 9, 2016, 9:45 p.m.
As anyone who lives in a sprawling, rapidly-growing city like Miami can tell you, traffic can sometimes be a pain. Tonight, said traffic was giving a royal headache as it caused me to miss most of O, Miami’s Under the Influence event, where poets like Campbell McGrath and Kevin James shared poems that inspired them to write, and share, their own poems. But while I missed most of the festivities, I did get a chance to focus on one of the projects developed for this year’s festival, perched curiously in the lobby of the Art Deco Museum. I spied a small wooden box on a ledge above the complimentary cans of Perrier. It would have been so nondescript as to be ignored, were it not for its lone red button on top, and the metal inlay of the O, brand on its front. Saturday, April 9, 2016, 7:30 p.m. The crowd was lively at the Art Deco Welcome Center on South Beach on Saturday night when poets Campbell McGrath, Kevin Young, and Melanie Almeder came together for the O, Miami Festival’s annual “Under the Influence” reading. The hour-long frenzy featured poets sharing poetry that influenced them, as well as some of their own poetry. Influences included: James Tate, Richard Hugo, James Heaney, Langston Hughes, and many, many more. The mood was light as the audience listened to poems about getting drunk, about riding the bus, and about why McGrath is so certain his music is better than everybody else’s. It was a deluge of poetry, in the very best way, and afterwards we all went to The Betsy for a drink. April 8, 2016, 7:50 p.m. I am vibing on the perfect weather on South Beach, and the even more perfect vibe among the people gathering in Soundscape Park in front of the New World Center next to Lincoln Road, waiting for the start of Poetry in the Park, taking place April 8th. The manicured lawn was sprouting a lovely, colorful carpet of diversity: young and old in all shades of the human rainbow; families of all shapes, sizes and sexual identities (Pride was happening just a few blocks away); pets and their people, even some in matching finery. They all were congregating amiably, enjoying the breezy weather, waiting for the main event. A pair of fit, friendly girls named Cari and Lee, were weaving in and out of the growing crowd, passing out free, healthy snacks from the Kind Company. With each snack, they also handed out cards redeemable for another free Kind bar. The twist was that you were supposed to hand the card to someone you observe performing an act of kindness—a sweet way to pay it forward, so to speak. At around 7:55, a countdown appeared on the 7,000 square-foot wall of the New World Center building, alerting the crowd to gather around and find their seats for the main event. Part of the Mary and Howard Frank Plaza, the wall is regularly used by the City of Miami Beach to project outdoor movies in the evenings for local residents. As the larger than life clock ticked down to 0, the crowd hushed in anticipation. They were not disappointed, as the presentation, which included readings from artists like poet Tere Figueras Negrete, winner of the That’s so Miami contest, singing duo Afrobeta, who sang a song specially written for O, Miami, got the crowd pumped for the featured artist, our nation’s firs Hispanic poet laureate, Juan Felipe Herrera. He first appeared onscreen—or rather, wall—in a mini documentary chronicling a class he lead with the children of Poinciana Park Elementary school in Liberty City. I don’t know whose excitement was for infectious, his or the children’s, as he led them through a lyrical world involving the power of clouds and poetry. When he finally took to the cinematic stage to read his work, he kept the crowd mesmerized with his lyrical stylings and intimate banter, and inspired the audience, both in the film and in the park, to participate in his lively performance. As I rode the bus home from the event, a man, tired and agitated from his hotel cleaning job (judging by his dusty uniform) on Miami Beach, was short the 25 cents he needed to complete his fare and go home. The bus driver let him on anyway. When I got to my stop, I handed him my Kind card, gave him a brief explanation of what it was about, and went on my way. April 8, 2016, 7:15 p.m. While attendees of Poetry in the Park relaxed and waited for the main event to start, they were treated to a taste of one of O, Miami’s more vocal projects for poetry outreach, Poetry Protests. 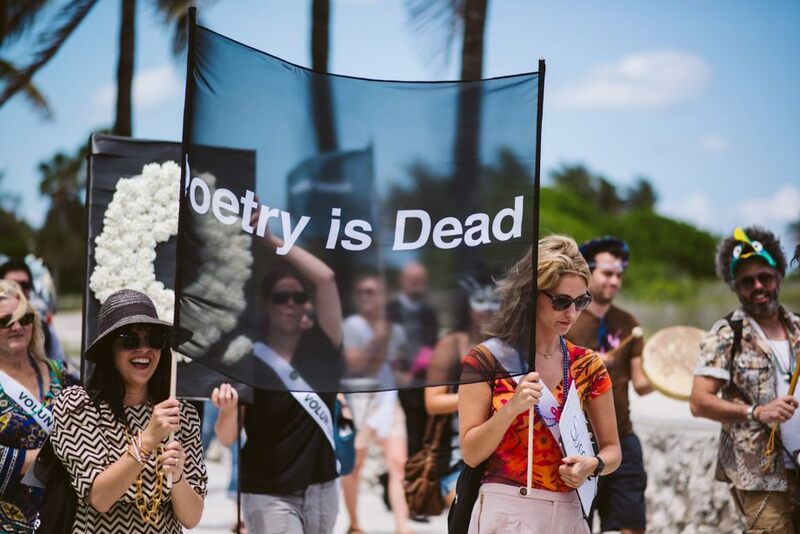 Coordinated by artist/activist Marc Saviano, the demonstration, set up on the eastbound side of 17th Street next to Soundscape Park, was a more in-your-face way of getting the word out to South Beach’s commuter and foot traffic about the need to support poetry, art and the people who create it, in our community. A friend of Saviano’s had participated in O, Miami events before, and suggested that he submit some ideas for this year’s festival. “She knew I had weird ideas, so I submitted a few, and O, Miami selected this one, and we followed up on it.” A call to artists went out for the haikus, and then O, volunteers helped create the signs and joined the protests, which are happening at various locations and times throughout the month. 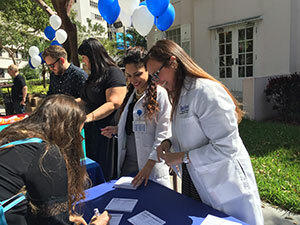 April 7, 2016, 12:30 p.m.
On a bright, sunny Miami day like this, the last place you’d want to be is at the hospital, unless you were attending the O, Miami Poetry Health Fair, hosted in partnership with Jackson Health system, which took place at Alamo Park, located in Jackson Memorial Hospital. Volunteers from O, Miami and Jackson worked together to bring a little lyrical healing to attendees while they enjoyed free, healthy snacks from the Kind company, free massages from Lumina massage, and some soothing jazz music from the Mike Levine Quartet as part of the Jazz @ Jackson lunchtime concert series. 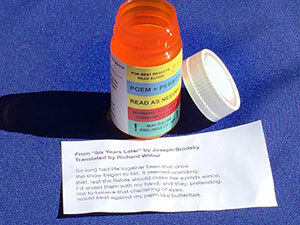 The highlight of the event was attendees getting their very own poetry prescriptions to enjoy, complete in a handy medicine vial filled with restorative verse in English, Spanish or Creole. Poetry-deficient patients were asked to fill out specially created prescriptions with volunteers like Vanessa Goodnow and Hoda Masmoue (both from Jackson’s pharmacy), which asked what ailment they’d like relief from, such as sadness, boredom, etc., or if they wanted to enhance the good feeling they already had. Volunteers like Tere Figueras Negrete, also with Jackson, then filled the prescription in one of the available three languages, according to the answers patients gave on their prescriptions. Vanessa Goodnow, Hoda Masmoue, and Tere Figueras Negrete fill prescriptions. 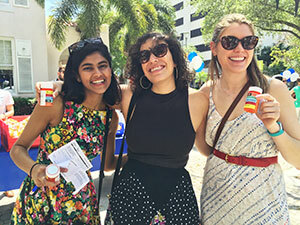 A trio of patients, Jillian Feldmeth, Vanessa Block, and Jill Shah, visiting from New York and Chicago, enjoyed the prescriptions they received, sharing them like giggling school girls trading love notes during lunch. They’d heard about the event from a mutual friend, and decided to check it out. I asked them if they were happy with their prescriptions, and they said, almost in unison, a resounding yes. already with you, when you think you’re coming. It was the perfect remedy for my desire to focus more on the beauty of poetry. April 2, 2016, 12:30 p.m.
Eleanor Roosevelt once said, “The future belongs to those who believe in the beauty of their dreams.” It is a sentiment that O, Miami took to heart at the Les Petites Poètes event on April 2 at the Betsy Hotel in Miami Beach. Showcasing the talents of the littlest literati from elementary schools in Sunrise, Broward County, and Liberty City, Miami-Dade County, the young poets in training got the chance to read their original works for their families, friends and supporters in the Writing Salon, an intimate space dedicated to such celebrations at the hotel. Sady Diaz, a curly-haired dynamo, kept the kids and the festivities moving with an infectious enthusiasm. Serving as the mistress of ceremonies, the Public Engagement Manager for the city of Sunrise introduced and encouraged each student to speak their name and school clearly before reciting their poems. The culmination of a two-month long project in partnership with O, Miami and the City of Sunrise’s Word Up! Poetry Initiative, Les Petites Poètes helped the participating students develop their poems through working with in-classroom writing coaches. They then selected their best pieces to get them ready for the chapbook that was specially created for the reading. Two of the highlights of the reading were the young guests that were invited to read and provide inspiration for the petites poètes to continue in their creative work. Broward College student Marnino Toussaint, whose soulful, spoken-word artistry showed a mastery well beyond his boyish 19 years, read a couple of his pieces for the enthusiastic crowd. Chastity Hale, 17, still a junior at Miami Arts High, read from a piece that showed why she was selected by the National Student Poets Program to read for First Lady Michelle Obama, who is an honorary chairwoman for the program, last October. With this caliber of young artists to serve as their role models, and after some well-deserved refreshments, the young poets went forth happily towards their lyrically bright futures, some even sporting the jaunty little berets they received as souvenirs of the day. Check out the full calendar of events at the O, Miami website. April 1, 2016, 8:15 a.m.
Florida Book Review editor Lynne Barrett interviewed O, Miami director P. Scott Cunningham for Burrow Press' new web magazine Fantastic Floridas. Read the interview here. I almost April fooled myself when I arrived at 4:30 p.m., as the website directed. I started to head home, thinking O, Miami’s "Flip the Script" event, kicking off their April-long celebration of National Poetry Month, had been that morning, as the printout stated, but something told me to get off at the next Metro Mover stop and circle back to the Bayfront Park station, and I wasn’t disappointed. Seated on a metal stool, a dunce cap perched on her pig-tailed head, was what looked like a little school girl in all her plaid parochial finery, holding a sign styled after the kind you see roadside hawkers twirling to direct you to sell your gold, or more often nowadays, try the newest vape joint. Instead of some garish shade of neon, hers was plain white, asking simply, “Are you sorry?” She occasionally flipped it to its other side to reveal the question, “Will you be sorry?” while she hopped off her stool to do a little two-step in her tap shoes. Even event coordinator/performer Rudi Goblen, dressed in a dapper fitted black suit, did a stint holding a sign that asked, “Will you take off your glasses?” Goblen, who conceived the project as a unique way to engage pedestrians visually in Justice’s work, collaborated with three other local Miami performers to create the characters developed from lines of the poem. They included a goggled young man in a bright yellow rain slicker, played by Louis Cuevas, whose sign asked “Is it raining out?” (Most existential answer: “I can tell you that it’s not raining out, but I’m not sure whether it’s raining within.”) Gerardo Pillatti played a Where’s Waldo expy (who elicited a honking, “Hey, I found you!” response from a passing driver at one point), whose sign asked, “Do you often travel alone?” The crowd favorite seemed to be the lady with the curvaceous pink print dress and sky-high heels, played by Katie Stirman, serving it to the rush hour traffic as her sign asked, “What is your occupation?" “I thought she was a model, she was dressed so fabulously,” said Mariella Lopez-Albear when I asked her what was talking about when she stopped to engage Stirman. “I thought she was doing something for New York with the photographer, then I saw the sign, so I stopped to ask.” They discussed the project, O, Miami, and poetry, particularly throughout this month. Lopez-Albear planned to visit the website when she got home. “We need more culture in Miami,” she said.